Zagreb has that certain something something. An intangible vibe that the French people vaguely term Je Nes Sais Quoi. Is it the blue trams, the gorgeous people, the public art work, the historical buildings? 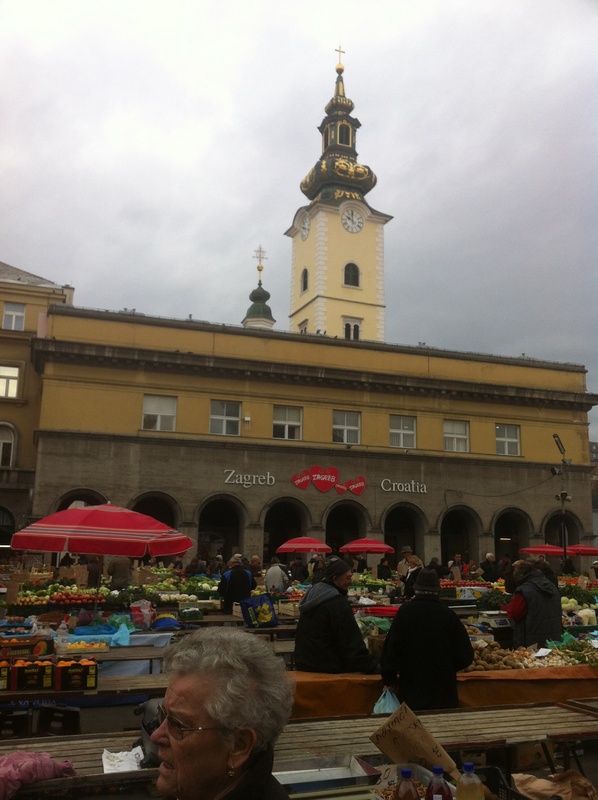 Or is it all these things and more that had me saying ‘Wow, we are in Zagreb’ on our initial arrival and on our return….. Heavy lasting snow that is common during the Zagreb winter has failed to materialise this season. The night is cool and pleasant as we wander back through Ban Jelacic square after our enthusiastic landlady’s greeting. Passing our previous Zagreb apartment as we head to Vegihop for dinner we look up at the window in recognition. Despite the long gap between visits the handsome waiter at Vegihop recognizes us on our return and greets us ‘Ah Australia’. He asks us about our travels and we give him a quick run down of our adventures since last we met along with our blog address. Dinner at Vegihop is hot and tasty as usual. 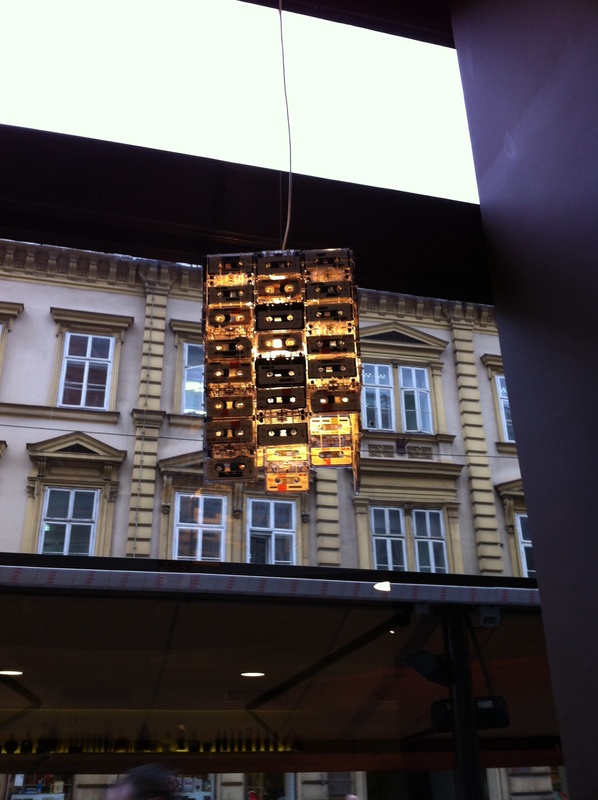 We both recommend Vegihop as a great option for any vegetarians (or anyone in search of good food) traveling in Zagreb. Back out in the Zagreb streets we pass a wine and cheese bar that we had both wished to go to last time we were in Zagreb. We spend a relaxing couple of hours finding the bottom of some great bottles of wine while feasting on a wide variety of local cheeses. Round tight bellies lead us back to our apartment. Traveling does not remove one from the cyclical realities of life. Despite plenty of sweating we have not done any washing since Dubrovnik. First order of our last full day in Croatia, washa washa washa. Almost every article of clothing I am carrying with me needs washing, Pam is facing a similar quandary. What do we wear to the laundromat and out and about in stylish Zagreb for the day? I end up in my long thermal undergarments wearing the shorts and shirt that I had last worn hiking during the Camino in Spain over the top. Combined with my worn out and bursting at the seams boots and Pacerpoles I look quite the sight (or is it fright?). Pam has concocted her own similar ensemble. Last time I carried my backpack full of our combined clothes in search of a laundry I ended up falling badly and painfully wound up on my back waving my Pacerpoles in the air like some upturned turtle in Logrono Spain. I am loath to repeat that experience and take especial care with my foot placement as we climb past the cathedral towards the laundry service. There is no flicker of recognition from the girl who receives our laundry load. 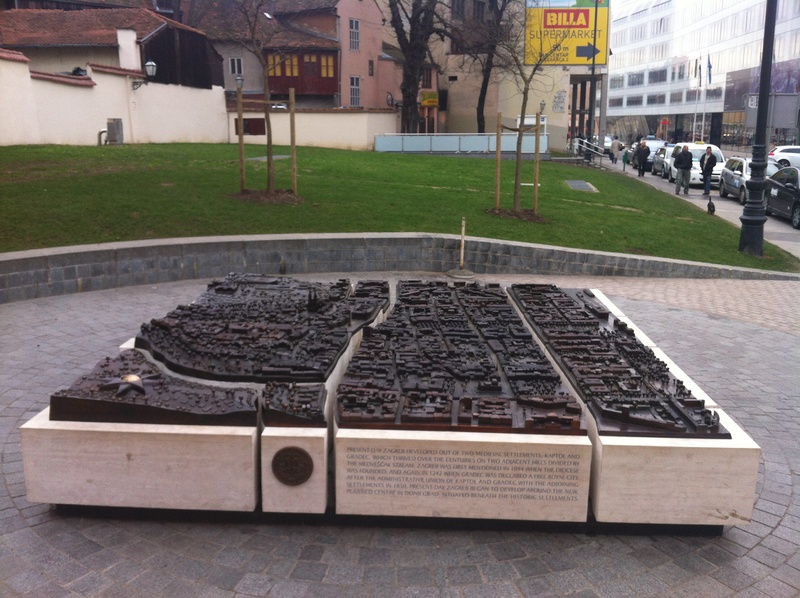 Returning via the busy market allows me to photograph the brand new 3D model of Zagreb that was still in construction when last we were here as well as a couple of statues that we missed last time. Back in our room again I swap my big backpack for the day pack I carry our cold and wet weather gear in and we set out into Zagreb once more. 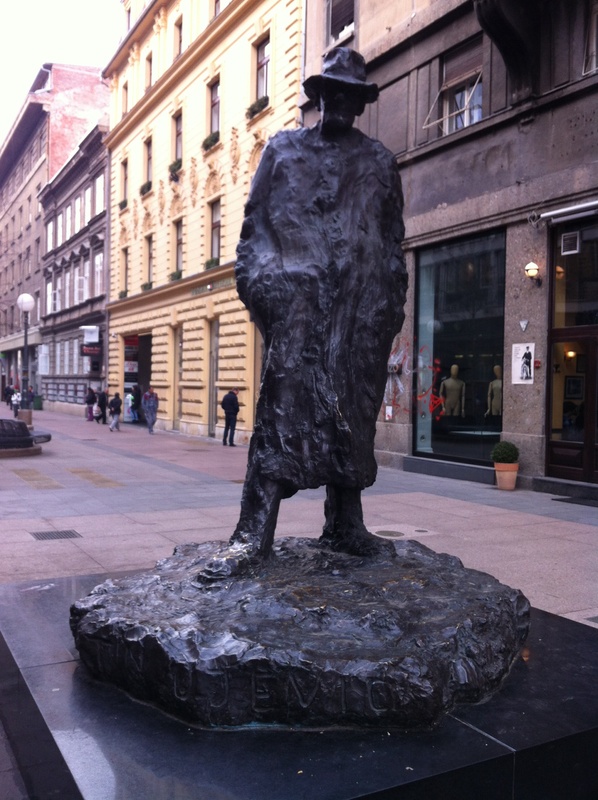 Today our only fixed plan is to visit the Ivan Mestrovic museum in Zagreb Old Town. Pam leaves planning our route up to me. Out in the Zagreb streets we are drawing amused stares, we must look truly ‘special’. 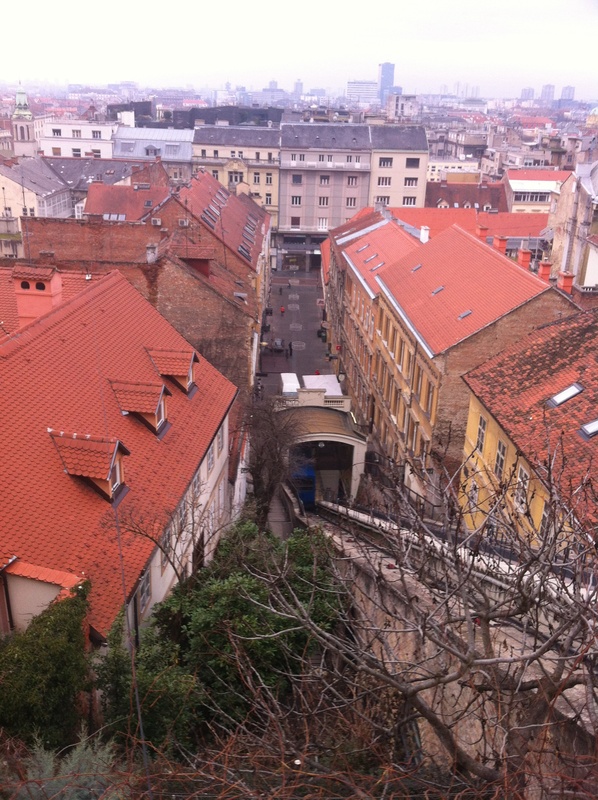 Our previous visit to Zagreb had us climbing the hill via stairs beside the Funicular, today I am determined to ride it. 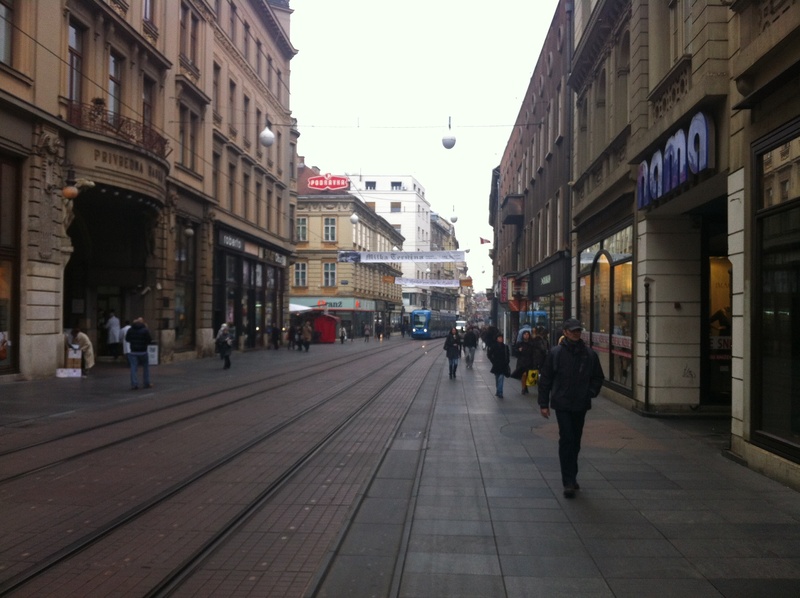 We set off down Ilica street from the Ban Jelicic square. We ride the worlds shortest functioning railway to the top, a minute of placid uphill fun, and set off along cobblestone streets of the Old Town in search of the museum. Minutia such as driftwood sculptures in house windows, beautiful metal work filling studded doors, stained glass windows that we had not noticed on our first more rushed walk around this area becomes more apparent on our return. The whole area is scrupulously clean and trash free in the usual Croatian manner. 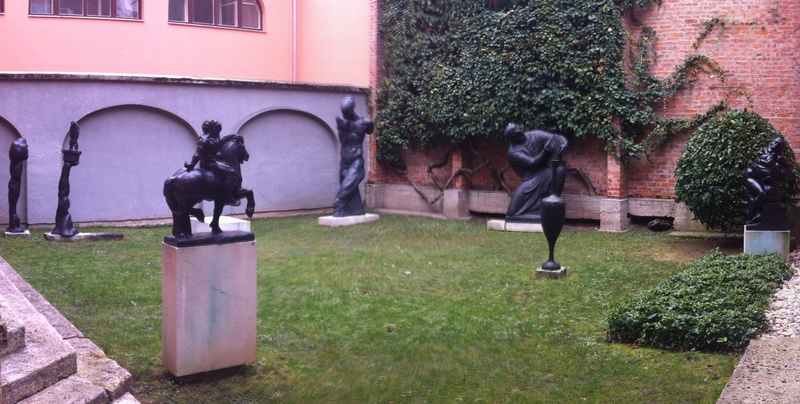 Turning from the street between tall dark doors we enter a small paved courtyard where statues fill spaces between columns surrounding the open to the sky square. 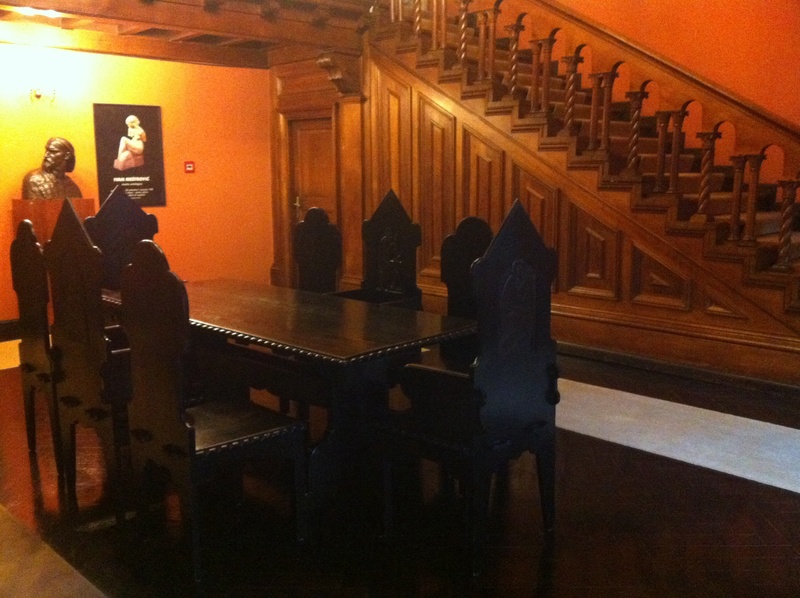 Stone stairs to the left take us to the entry foyer where we pay the small entry fee. I leave my Pacerpoles at the umbrella stand in the corner. 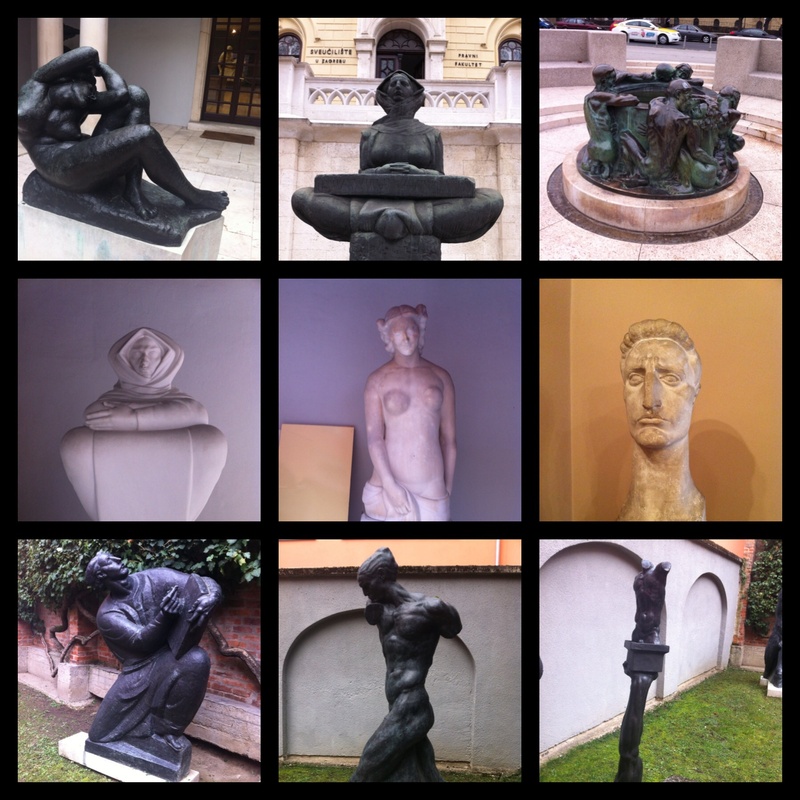 Ivan Mestrovic was renowned as a brilliant architect along with his genius for sculpture. The building that now functions as a museum housing a portion of his sculpture work was designed as his principle residence in Zagreb. His eyes as a young man are only equalled in intensity by the diamond gaze of Nikola Tesla whom he met in New York in 1924. These two brilliant men became good friends and admirers of each other’s works. Beyond the first large room of the house/museum large glass doors lead to a green courtyard filled with black stone statues. Accompanied by no plaques bearing names or descriptions of the works on display the observer is left to their own imagination. I am no art expert or critic or historian. I approach each gallery or museum full of naivety and ignorance. I only know what moves me, what excites me. 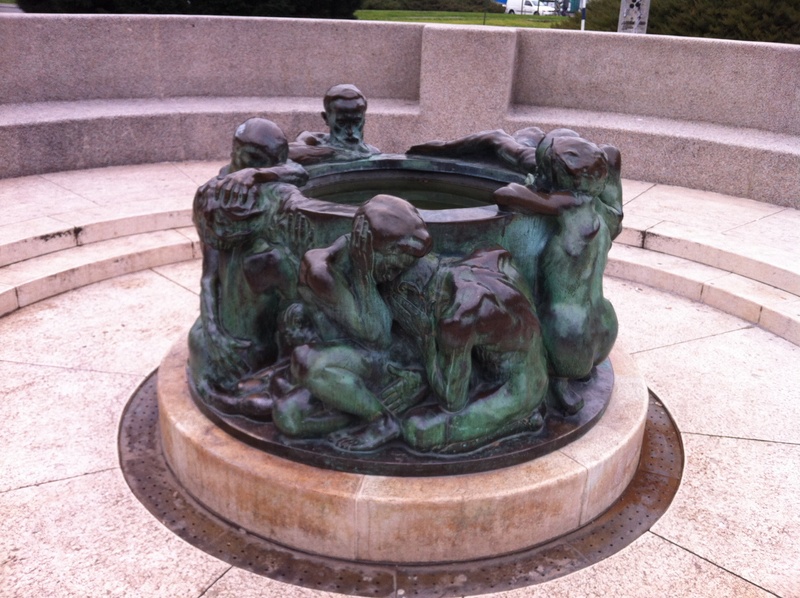 Ivan Mestrovic’s work has a unique angularity, a clarity of vision. Statues radiate life and purpose. Great art works have a presence and impact that just can’t be captured via the mechanical lens. Only transporting your own natural lenses to them will suffice. Making our way up the stairs to the second floor I notice we are being followed by one of the museum staff. Some of the statues being displayed are quite small and I wonder if she is concerned by my daypack. Shortly after we begin our tour of the second floor she joins us, there is only enthusiasm here. She begins giving us a spontaneous explanation for each statue. Statues of his friends children, his own wives and children. We enter his bedroom which has a ceiling covered in a mural he painted. Our friendly guide tells us that Ivan Mestrovic was a workaholic who produced over 2000 works as well as designing buildings and crypts. She asks us if we have seen any of his work and we tell her a little of our travels in Croatia and Montenegro. 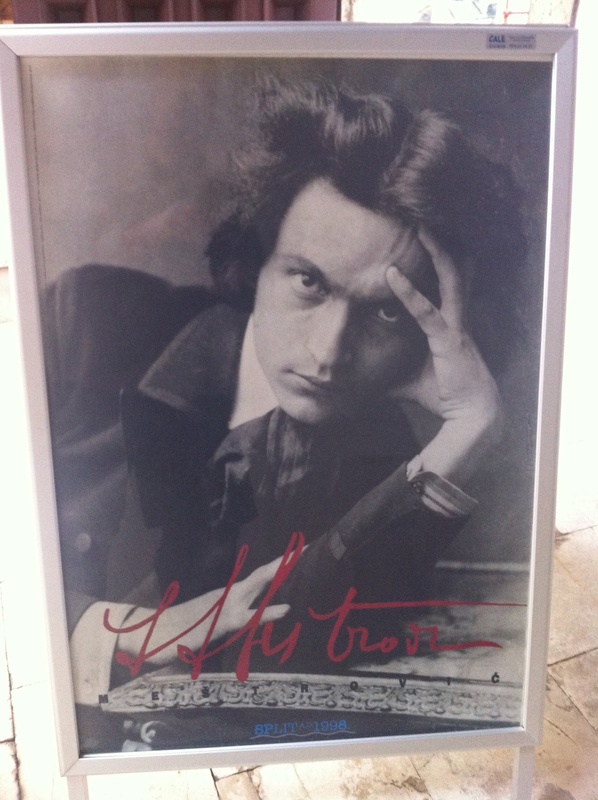 The exhibition in Zadar, the massive statue in Split along with our disappointment in missing the large museum devoted to his work there. The awe inspiring mausoleum atop Mt Lovcen in Montenegro. 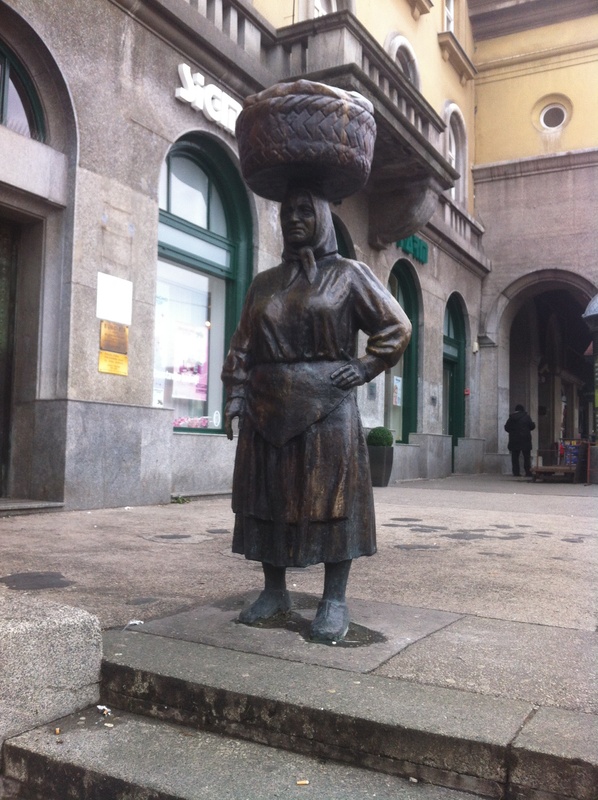 Our guide goes on to tell us of other Mestrovic works displayed on the streets of Zagreb and we assure her we will do our best to see them before we leave. Now we have a plan for our afternoon. There is a small third floor in the building and once our tour is done we thank our lovely guide for taking the time to educate us a little more about the life and work of an amazing prolific artist. No step could have ever been taken quietly in this large wooden building. Creaking stairs declare their farewell with each foot fall as we descend. Streets we have not previously walked take us back to the new town below. Rain threatens from suddenly dark skies. Pam’s disappointment in finding the Nishta vegetarian restaurant in Dubrovnik closed was slightly mollified by the online discovery they intended to open a restaurant in Zagreb that should be operational by the time of our return. We set off in search of the supposed address only to find no sign whatsoever of the restaurant. A quick online search conducted in the busy street grants no reward. 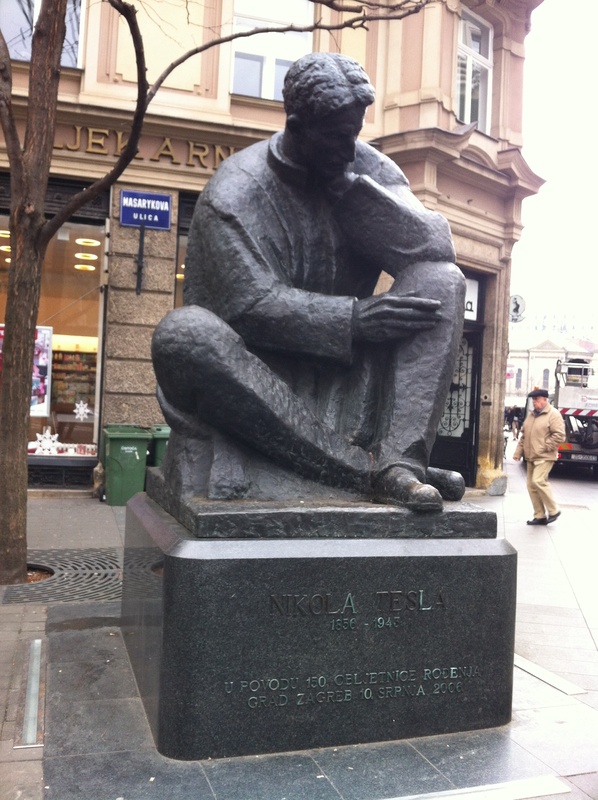 The street where the restaurant should be on passes an Ivan Mestrovic statue of his friend Nikola Tesla. We follow further to the Croatian National Theatre where a Mestrovic statue ‘Well of Life’ occupies the base of a small concrete amphitheater. 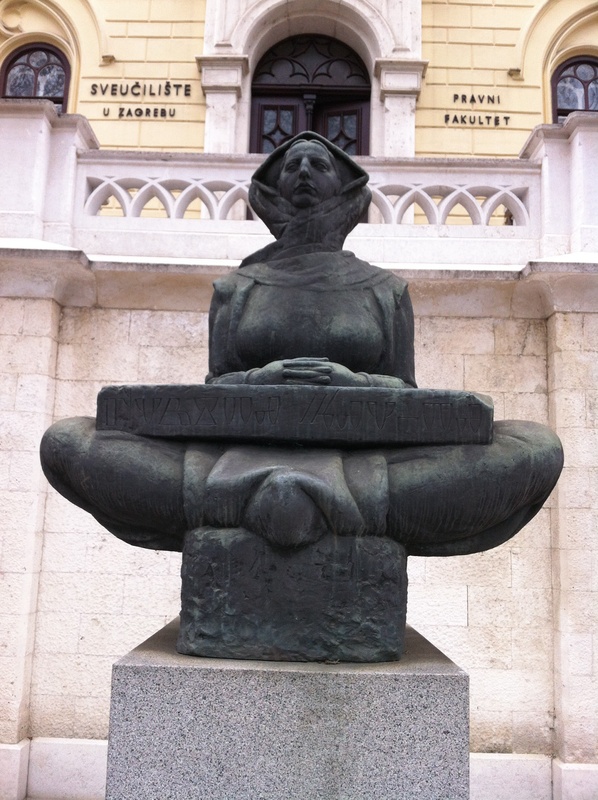 Across the street a Madonna sits in typical Mestrovic pose in front of the Zagreb University. 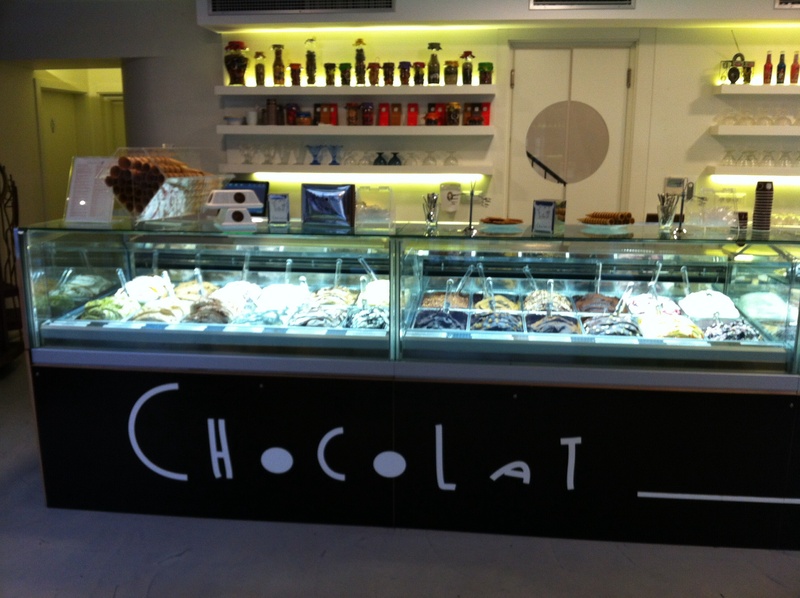 Our short tour of the Mestrovic statues suggested by our enthusiastic museum guide has taken us past Chocolat 041 the funky ice cream and cake shop I had been so delighted with on our last visit to Zagreb. To check that the new ‘Worlds best Chocolate Ice Cream’ status that I had awarded their dark chocolate desert with previously was not just some strange sensorial illusion or aberration I insist that we revisit the store. Inside the store delights once again. I ask the lovely girl serving about who makes the ice cream and she responds ‘I do’. I congratulate her profusely and go on to tell her how much I like the design inside. 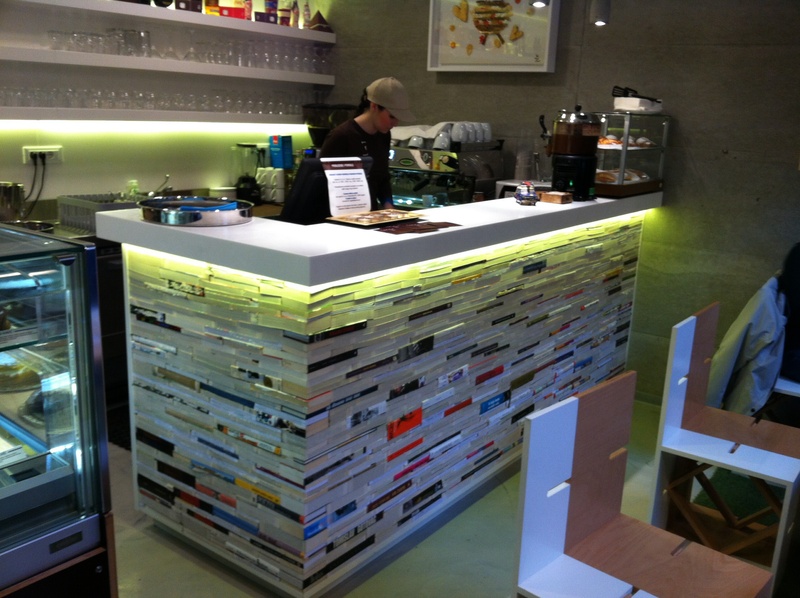 She tells me that the counter was made from books she and the owner glued together and took ages to complete. I stroke open a few pages with my thumb to verify her tale, indeed it is made of actual books. Lampshades made from old discarded cassette tapes cast odd shaped shadows on the walls. Now for the true test, I take my first spoonful of the double scoop I ordered. There was no illusion the first time, this is truly sensational ice-cream. I drive Pam into a frenzy with my attempt to clink clink clink the last dark drop from the bowl. Finally Pam drags me rhapsodising from the store. She is hungry for something more substantial than sweet chocolate heaven. Rain has begun to fall lightly by now and we settle for vegiburgers from the Green Spot. We had already tried their fare the night we saw the Battleship Potemkin accompanied by the Zagreb Philharmonic on our previous visit. Simple spicy burgers we eat in the street before finding our way back to the apartment. Pam declares she is too tired to accompany me to regather our washing. I find a shortcut that dramatically reduces the distance I need to walk to regather our clothes. 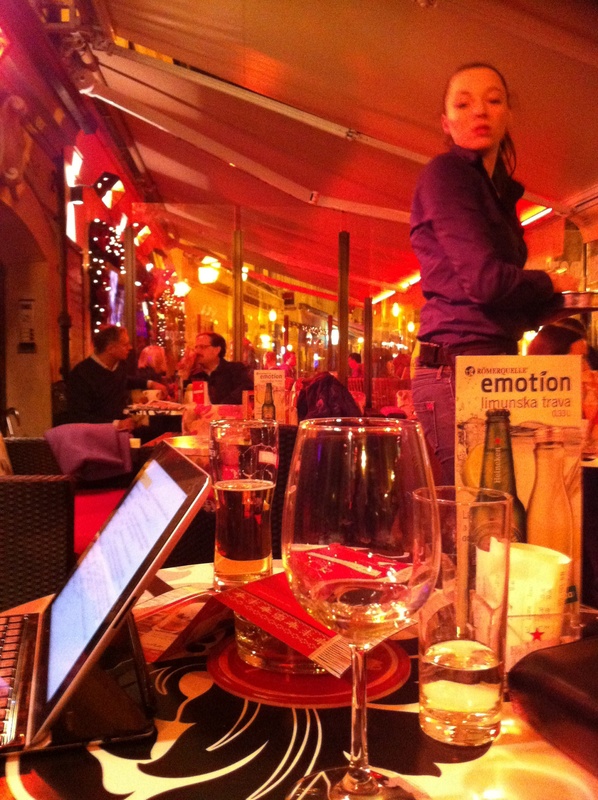 Back in our usual uniform we find a warm bar and work on the blog as the rain falls in earnest. Our energetic landlord told us the best local restaurant was Nokturno which is just around the corner from the bar where we type away. The restaurant is busy with Zagreb locals which is unusual. As per her advice our meal is delicious and inexpensive. Local knowledge is the best knowledge.